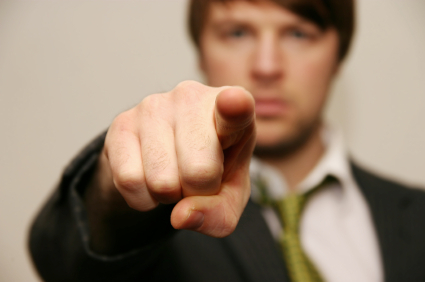 When things go wrong, most companies’ kneejerk reaction is to look for someone to blame. If you’re BP, you blame the contractor. Other times, you might blame another employee. The blame game is never a good idea. Customers don’t want to hear it. What they want is for your company to step up to the plate, take responsibility, and resolve whatever issue they’re having. But the blame game becomes an especially horrific idea when companies decide to blame the customer. In the past couple of weeks alone, we’ve seen two major brands take this incredibly stupid PR approach. Needless to say, customers were less than thrilled with Apple’s response, and they only got more upset. Finally, Apple responded by giving them what they wanted (free bumpers for improving phone signal), but the PR crisis could have been much smaller if they had done that from the beginning. But Apple isn’t the only company who mistakenly points the finger at the customer. Remember the Toyota debacle from a few months back? In case you don’t let me refresh your memory. All across the country, people were getting into wrecks and many died because of sudden acceleration in Toyota’s vehicles. Well, just when things have finally started to quiet down for the auto manufacturer, they insist on stirring things back up by saying some new research shows that drivers were to blame for the accidents. “Toyota Motor Corp.’s investigation of accidents involving unintended acceleration where motorists said they pressed on the brake pedal shows that “virtually all” involved drivers who pushed the accelerator instead, a company spokesman said. Auto safety advocates called the report “totally ludicrous.” It’s easy to understand why Toyota did this, as they were trying to reestablish their credibility, but it’s just never a good idea to blame the customer-even if he really is the one to blame. The public still sees Toyota as responsible for all those accidents. Period. What the point? It’s never a good PR tactic to blame your customers. Remember, you need these people to keep you in business. Accusing them and being arrogant will only drive them away and kill your company.